A Symbian-injected followup to the so-so Windows Mobile Omnia, the HD i8910 is a specced-out slab of phone from Samsung, with a 3.7-inch AMOLED screen, 8MP camera, HD video recording and a definite thing for multimedia. The Price: TBD, at least as far as subsidized carrier deals go. You can grab it unlocked now for about $650, but 3G may not work on your carrier. The Verdict: The Omnia HD does everything fine, and a few things extremely well. Video playback is top notch and widely compatible, the camera is among the best I've ever seen on a cellphone, and the video recording can actually hang with a lot of pocket cams, like the Flip or Kodak Zi series. On all other counts the phone never falls flat, but it never really shines, either. The Hardware: Your first impression of the Omnia HD is that it's big, but that's not really fair: It's a tall device, but it's not meaningfully larger than any of the other popular touchscreen phones on the market today—it's just proportioned differently (see the gallery below for comparison). And for all the hardware crammed inside, it's reasonably thin. Speaking of guts: It's got HSDPA (on European bands), GPS, 8-16GB of internal storage with microSD expansion, and 8MP, 720p-recording camera sensor, a built-in flash bulb, a forward-facing video camera, USB connector and a 3.5mm jack. The lack of HDMI-out is semi-replaced by DLNA network streaming, though it's not really an even trade. At any rate, it's a healthy phone, hardware-wise. Samsung touts the AMOLED screen over pretty much everything else, and with some good reason. It's vibrant and sharp, but side by side with an iPod Touch, it isn't strikingly better. The benefits of the OLED, such as they are, seem to manifest themselves more in the phone's long-ish battery life than anything else. In terms of touch, it's a capacitive panel, and it's extremely responsive. Any lag or difficulties with touch controls or soft keyboard are entirely down to the software. Cellphone cameras are generally horrible, so the Omnia HD's camera is a rare treat. Seriously: I even trusted it to shoot a headphone review last week, and it came through impressively well. It'll match a low-end point-and-shoot in most situations, barring low-light—the sensor can't really handle darker situations too well, and the flash is pretty wimpy—and fast-motion scenes. Video, on the other hand, is at least pocket-cam quality. In daylight it's razor-sharp at 720p, while in low light it's passable. Novel-but-not-terribly-useful slo-mo and high-speed modes are thrown in for good measure. The Omnia HD doesn't quite match up to the best-of-the-bunch Kodak Zi8, for example, but it's amazingly close, especially for a phone. A phone, with a decent camera! How did this happen? The Software: This is where things fall apart a little. Wherever the Omnia HD's hardware shines—along with the kickass camera, it can handle HD video playback in plenty of codecs—the software is fine. The camera interface and media playback interfaces, music and video, are never distracting and usually do what you expect. Everything else? That's a different story. Samsung's thrown the old Omnia's TouchWiz widget UI, originally designed for Windows Mobile, onto the Symbian-powered HD. This in itself is fine, since TouchWiz has always been a decent, finger-friendly homescreen, wherever it shows up. Outside of the three main TouchWiz panels, though, is a bizarre UI stew, some from Symbian, some from Samsung, and some from the deepest bowels of design hell. For example: Scrolling! Instead of throwing menus and selecting entries, the selection follows your finger. It's hard to explain, but it's a terrible way to have to trudge around a menu-heavy operating system. The onscreen keyboard seems to be a Samsung special too. It's fine—it's spacious and rarely lags—but it's set on a perfect grid, doesn't come with any autocorrect and generally feels like it was designed in about an hour. Outside of the core multimedia and homescreen areas, the phone is a fairly raw take on Symbian's S60 5th Edition shell, which means the UI is inconsistent and difficult to tackle with fingers. Not to mention S60's needlessly inserted extra steps all over the place. Want to enter a URL? Press a button, type your address, press another button, and press another. It doesn't make any sense. 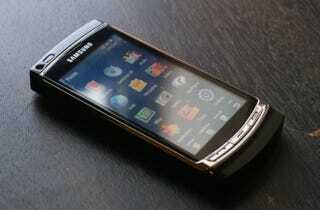 Samsung's given Symbian something of a makeover, but most of Matt's complaints about the N97 software carry over to the HD. Everything—even basic calling, contact management and OS navigation—is overcomplicated and disorganized, beyond the point of a "learning curve." Functionally, though, it holds up fine: The browser could be easier to navigate with, but renders with WebKit, supports Flash and generally does its job. Same goes for pretty much everything else: The experience could be smoother, but you'd be hard pressed to find a task that the HD explicitly can't handle. And if you do find a gap, remember that this is full Symbian, so you can always go app hunting. As dumb as the UI can be, don't be fooled into thinking this is a dumbphone: It can do pretty much anything an Android or Windows Mobile phone can, and sometimes even more—it's just that sometimes, it's painfully awkward.